Webb ran for two touchdowns and also scored on a pair of 2-point conversions on Thursday night as the defending AFC champions rallied from a 17-0 first-half deficit to beat Washington 26-17 in the teams’ exhibition openers. 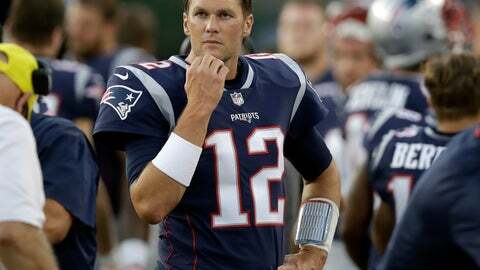 McCoy outplayed New England’s Brian Hoyer in a scrimmage of backup quarterbacks, while starters Tom Brady and Alex Smith stayed on the sidelines counting their money. On the day that the Patriots reportedly sweetened Brady’s contract with $5 million in incentives, the reigning NFL MVP sat out the game, along with tight end Rob Gronkowski. ESPN reported before the game that the Patriots would add $5 million in incentives to Brady’s contract, which was due to pay him $15 million. That would bring the 41-year-old, five-time Super Bowl champion closer in pay to less accomplished quarterbacks around the league — including Smith, who got a four-year, $94 million extension from Washington. Brady’s agent, Don Yee, did not respond to an email seeking comment. Patriots spokesman Stacey James said the team does not comment on contracts. Hoyer struggled against the Washington starters, but drove New England to a pair of second-half touchdowns, including Webb’s 8-yard TD run followed by the catch on a 2-point conversion that gave New England an 18-17 lead. The Patriots offense did little until back-to-back 20-plus yard catches by Devin Lucien set up Stephen Gostkowski’s 52-yard field goal just before halftime. Mike Gillislee ran seven times for 31 yards on a drive that set up Jeremy Hill’s 1-yard run. Webb made it 18-17 with nine minutes left in the game and added an insurance score with 3:27 to play. Washington’s Dustin Hopkins, who kicked a 52-yard field goal at the end of the first quarter, banged a 56-yarder off the left upright just inside the two-minute warning.